One of the things I love about fall is that it’s finally cool enough for me to go hiking again. The summer is nice and all, but it’s usually muggy and buggy, and neither are things I handle well. Fall is perfect, particularly after a cold snap or two. The leaves are turning colors, and the sun is a little less brutal. I tend to lean towards short day hikes, usually in the mountains. 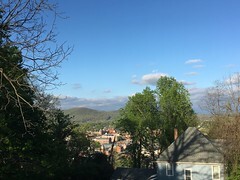 Richmond is ideally placed for access to a wide variety of locations, including being only an hour or so from the George Washington National Forest and the Shenandoah mountains. 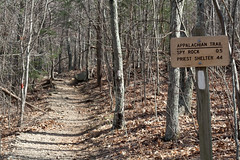 And heck, if I wanted to stay in town, I could hike the six or seven miles of trails along the James River. Last weekend, on my way to drop in on friends in Harrisonburg, I felt the mountains calling to me as I neared Afton, and so, rather than turning right, I turned left and hiked a bit of trail I had visited last winter. 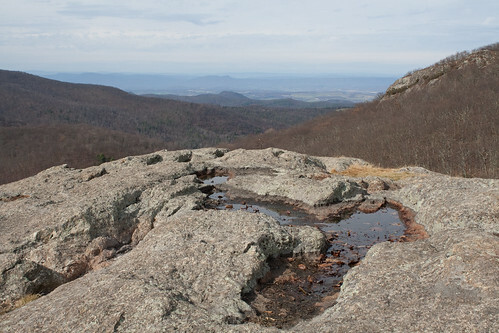 This particular hike is a mile up a forest service road and then a half mile down the Appalachian Trail to a large, mostly bald-faced rock outcropping. The incline is steady, and with plenty of loose rock to trip the feet going up and down. I found myself pausing to calm my breath and heart far more often than I would with companions. Usually, I push myself to keep up a reasonable pace and only stop when I absolutely need to. This time, I stopped whenever I wanted, for as long as I wanted, and didn’t feel guilty for slowing anyone down. It was during one of these stops that I resolved to do more solo hiking in the future. As I mentioned earlier, I had done this hike last winter (with friends). However, it was so foggy that day that we couldn’t see anything once we reached the summit. And it was cold. And windy. And miserable. Not this time, though. The weather was perfect. I started off wearing my fleece jacket, but quickly shed it. The effort my body was putting into moving towards the summit was enough to keep me warm and toasty, although I did appreciate the extra layer when the wind picked up at the top and there were no trees to shelter me. At one point along the service road, where the uphill bank is quite tall, a bit of rock juts out with a fairly level surface. 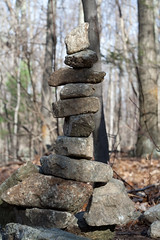 Previous hikers with some skill and humor have piled stones high on it, creating a tower that seems to weather well, or at least is recreated when Mother Nature cleans house. Some time after I passed that point, I found myself once again pausing to catch my breath. As my breathing calmed, I became quite still, listening to the world around me. That, too, had become quite still. Hardly a thing moved for several moments, and then a roaring came from behind as the wind resumed its symphony among the trees. I’m certain I would not have experienced that moment had I not been alone. By the time I reached Spy Rock, I was so happy to be there that I hardly thought twice about the scramble required to reach the top. This was the only part of the hike I hadn’t done before, and although I was slightly nervous about getting into a situation where I couldn’t go up or down, I decided to do it anyway. And, despite seeing or hearing no other hiker since shortly after leaving the parking lot, a couple came into view just as I headed around to the easier scramble on the back side of the rock. I took some comfort in knowing that at that point, I was no longer alone. The scramble challenged both my insecurities with walking across what I consider unstable surfaces and with heights. When I finally reached the top, a large and relatively flat surface of the rock, I sat for a moment and surveyed the terrain. The rock was not perfectly flat, of course, and sloped towards the side I summited. I took a few calming breaths. And took a few more. And then slowly made my way over to a point where I felt I could stand up fully. When I did, I realized I could navigate across the surface of most of the central part of the rock with more ease than I expected. The view was quite impressive. I wished I had come a week or so earlier, when the leaves were still brilliant and on the trees, but the views from all around were still lovely, albeit slightly muted. 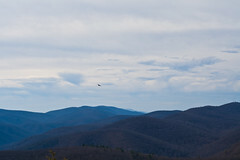 At one point, a hawk circled nearby, clearly enjoying the strong currents buffeting the mountain top. Since this was a last-minute trip, I didn’t have a few essentials with me. Namely, my hand-held GPS receiver loaded with nearby geocaches. I knew there was one up there, since we had tried to locate it on the first visit, but I didn’t know where. My phone, surprisingly, could get enough signal for me to check into Foursquare, but when I tried my geocaching app, it couldn’t keep the connection long enough to pull up anything. I decided that this was a sign I should come back and see if I can do the scramble a second time, knowing what it entails. I would have stayed up there longer, but the wind drove me back to the shelter of the trees. The return trip, along the same path that I took up, was relatively unremarkable, except that I didn’t need to stop and made it down in a quarter of the time it took to go up. Lessons learned: I can hike on my own and don’t need to be constrained by finding partners and keeping someone else’s pace. Sometimes being unprepared for the unknown challenges is easier, or at least less worrying. Leave the hand-held GPS (and spare batteries) in the car when the weather turns — it may be the right day to go hiking, no matter what the original plans may have been. Call them what you like, if you like rock ‘n roll. Puffy AmiYumi is a pop/rock duo from Japan. I first heard them on the Japan For Sale Vol. 2 album back when I was a volunteer at a college radio station. I liked what I heard, so I made sure to give their next release (Nice.) a few spins when it arrived at the station. That one made me a fan, and eventually I bought my own copy. The band is called Puffy in Japan, but when they started making inroads into the American music scene, they added on a combination of their own names so as not to be confused with the other Puffy. Ami Onuki and Yumi Yoshimura were brought together in 1995 by talent agencies and currently they have an animated series on the Cartoon Network (Hi Hi Puffy AmiYumi). The commercialized nature of the band should make me not like them, much in the way that I do not care for American Idol or the Backstreet Boys, but somehow this particular incarnation of the music industry’s pre-fabricated band formula does not make me want to retch every time I hear it. Maybe the Japanese know how to do it better. Listening to Puffy AmiYumi always puts me in a good mood. They never fail to deliver just the right mixture of the pop/rock formula that makes this child of the late 70s and 80s happy. Their latest album Splurge! continues with the Jpop/rock goodness.